Watson CCS understands the importance of keeping streets clean. 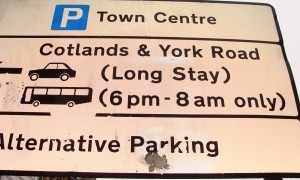 Large signs are a very effective way of getting a shop, business or company noticed. They also play a very important role in keeping our streets safe, guiding drivers and pointing people in the right direction. Unfortunately, they can get dirty very easily and this can affect not only the way they look, but the way people perceive them. Clean signs are important to give a good and lasting impression every time your shop or town is looked at as this creates a bright, cheerful, tidy impression. It is important to maintain high standards of signs and shutters and Watson CCS LTD have specialist qualified and experienced operatives and effective Sign Cleaning cleaning equipment to clean exterior signs to the high standard possible. Weather, graffiti and birds can cause signs to become dirty and unreadable so regular cleaning of them will eliminate that! Also regular sign cleaning and maintenance helps to increase the service life of your signs and any expensive future replacement costs! 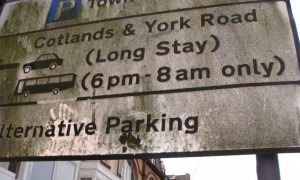 Our teams have been responsible for a lot of the sign cleaning in the borough of Bournemouth and the results have been excellent so why not give us a call for a no obligation free quote today. No job is too big or too small for our expert teams! Watson CCS LTD are dedicated to providing high quality, safe and also offer environmentally friendly sign cleaning services at cost effective prices and even work weekends if that is more convenient for you.